High-performance Platinum Series Machine MIG welding guns are engineered for long trouble-free performance with rebuildable design, extra flexible cable and a wide variety of wire sizes. High-performance extra-flexible cable assemblies, with 15% more copper, and spare switch wires built-in. Cables are easier to handle, run-cooler and last longer. 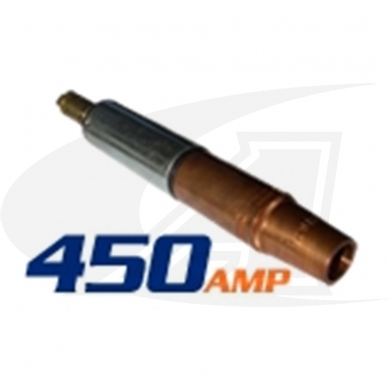 The 450 Amp AMT Machine Torch is available in 2', 4', 6', 8', 10', 12', 15', 20', and 25' cable assemblies and is capable of running .035 through 3/32 wire. Select the -- Liner Size -- Cable length -- and -- Feeder or Machine type -- from the drop down menus above.